Steven (Chicagoland, United States) on 16 November 2010 in Architecture and Portfolio. ...and a few shots later. 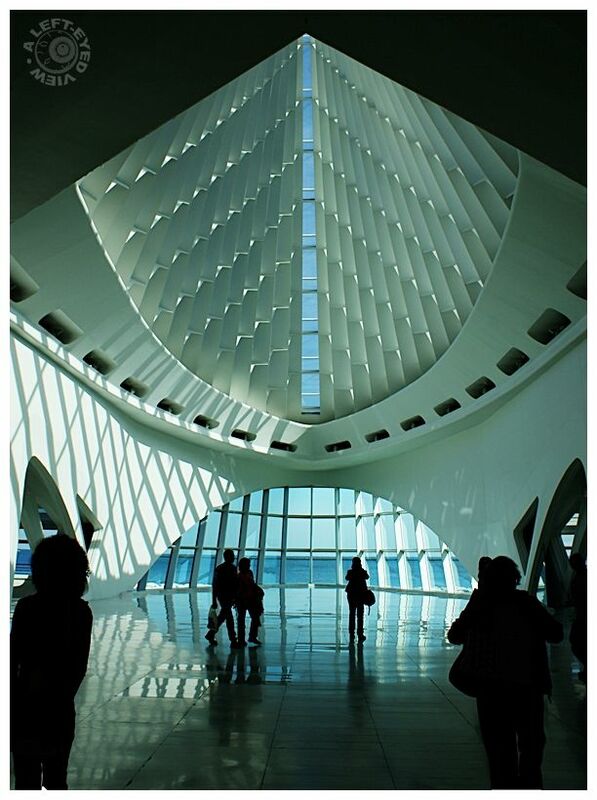 A capture inside the main exhibition hall of the Milwaukee Art Museum. I took a few steps back from Friday's photo to reveal the windows that overlook Lake Michigan to the east. And a few shots later, I finally got the vertical line of windows in the ceiling lined up with the point at the top of the composition. I like that the people in this composition show up as silhouettes. The exhibition hall's floor is in the shape of the bow of a ship; so appropo for Lake Michigan that is seen beyond the windows. Absolutely fantastic. Excellent frame and graphism ! Gorgeous thought and framing for this,Steven! !Great lights and a superb composition,love it!! Superb photo. Your light is very nice. Excellent work. Have a lovely day Steven. Like it very much. I'm glad you did a step back. I can't get over the magnificent design of this intereior and of course, you have really done a superb job, as you always do, of guiding us to the entire frame via your masterful composition and editing..and I REALLY appreciate your narrative, Steven, I usually look at the images first and then I read the text so my first thought was "Is that the lake out there?" And your words are perfect...I would hang around this room a whole bunch!! Beautifully done Steven!! Very modern and graphic, I like this !!!! Great compo, you could almost believe that you are on board a luxury cruise liner. Another stunning image . Having people there, their silhouettes, and reflection is fantastic . The geometry of this place is just fascinating.. perfect for phototaking and you do it so well! Beautiful architecture and the silhouettes are perfect for this. A lovely composition. This place is gorgeous. I enjoy this compo & light a lot, Steven.